If the $817 price tag doesn’t make you queasy, then maybe you can also stomach the ingredients that go into a Black Diamond, a scoop of ice cream from Dubai’s Scoopi Cafe that’s being billed as the world’s most expensive. 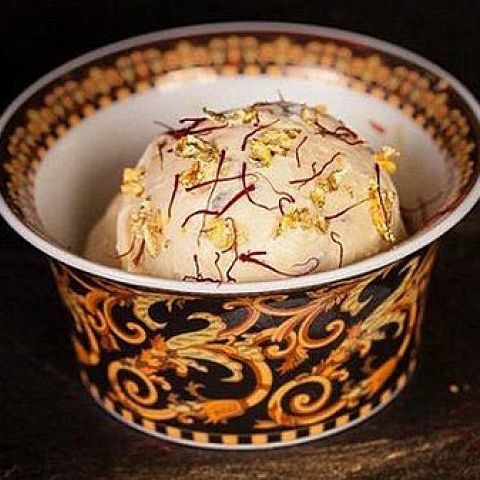 Owner Zubin Doshi theoretically took five weeks to select exactly the right exotic ingredients, and here’s what he came up with: Madagascar vanilla bean for the ice cream, threads of Iranian saffron, and black truffle from Italy. There’s also 23-karat gold leaf on top, because when you put together a super-expensive gimmick menu item, you’re legally required to include gold leaf. Also par for the course is a fancy dish customers can take home. In the case of the Black Diamond, it’s a bowl from Versace. Yes, there will always be people with more money than they know what to do with, and a few of them might even pay $800 for a scoop of ice cream, if for nothing else than bragging rights. But this particular item doesn’t really even sound that good. Saffron, truffle, vanilla, and customers with more money than actual taste? Yuck.